The digital cameras included with iPhone, Android, and many others, have an option to geotag pictures using the devices GPS hardware, effectively pinpointing the exact location a photo was taken and bundling that geographic location data into the metadata of a picture. While you can turn off photo geotagging on iPhone and iPad, many users don’t and opt to keep the feature on their GPS equipped digital cameras. This means that you can easily view the location a picture was taken, and retrieve the GPS coordinates. 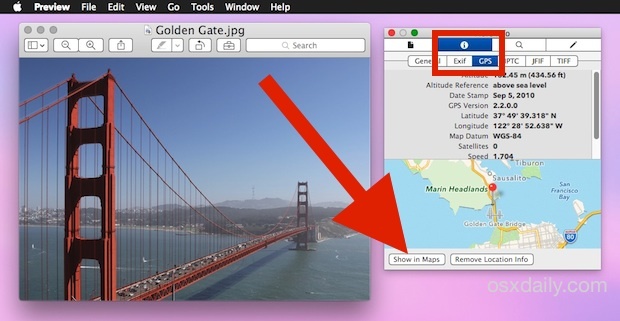 The Mac Preview app makes viewing an locating geographically tagged pictures extremely easy, placing the exact location on a map, and providing precise GPS coordinates to the spot where a given photograph was snapped. Do note this only works on pictures with GPS coordinates still embedded in them and assuming the user didn’t turn off the geotagging ability in iOS, Android, or Windows. * If you do not see a “GPS” tab then the image almost certainly does not include location data, either because it was never embedded to begin with, or because it was removed manually like this. If you want to try this yourself, you can use the picture from Wikipedia Commons like this one we used here. Once you learn how it works, you can try it with your own photos if you want. Keep in mind that most standard digital cameras do not embed GPS data at all since they do not have a GPS device attached to them by default, and instead you’ll have more luck with this feature working with pictures taken from a smartphone of some sort, be it an iPhone, iPad, Android, Windows phone, Blackberry, or whatever else has geographic location abilities. Many iPhone and Android users don’t think about this feature being enabled on their device cameras, and not only may geotagging be enabled for the Camera app in iOS, but often apps like Facebook, Instagram, Twitter, and other photo sharing and social network applications will attempt to embed GPS data as well. If you don’t want that to happen, pay more attention to what apps you allow to access your location data, and disable the ones you don’t want to embed geographic coordinates with. 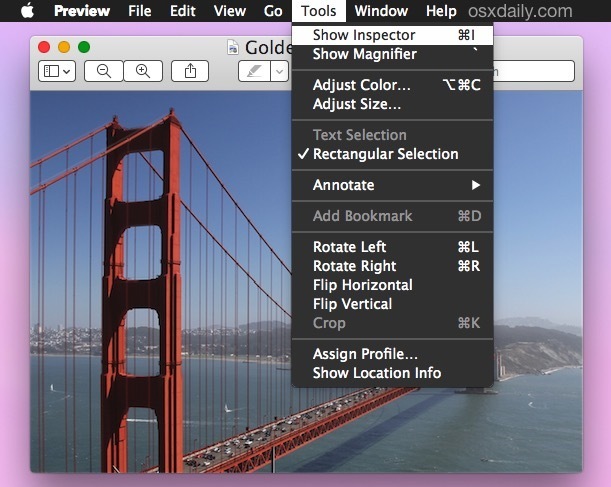 Remember, you can use apps to remove all GEO and EXIF data as well, even after that data has been embedded into a picture. 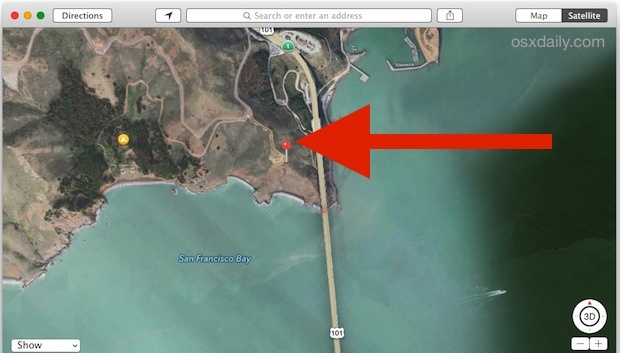 Do note that prior versions of OS X Preview app support the ability to view GPS coordinates for pictures with the data embedded within, but they lacked the built-in map feature, instead relying on a “locate” option. Apple misses one minus (-) in Longitude so pics taken in Alabama shows Tibet, China, Photos taken in Florida shows Uttar Pradesh, India as geographical position inside Photos on a mac. Apples is aware of this problem and is fixing it. I’m glad to know about this! I have a question, though. When I tell it to show in the Maps app, then click on the red pin and then on its circle-i, it opens Contacts but doesn’t seem to actually add anything. I selected an existing contact card, but I see no way to actually add the mapped location to the card. Why do not you use Photos? Just press command i, when you select more photos you will see them too. Is there a way to do this with an iPad? So, I now know where a certain photo was taken. Fine. But what if I know the location and would like to see ALL images from that spot (or region), regardless of date. Is there a way in Photos to display ALL images taken on a map and then zoom in to choose the ones of interest? Same question: how do I search by location? Clicking the location as instructed gives you a count of photos – in that little set only. What about the 30 other times you were there? And how does one search for “all photos from Yosemite?” It does not appear possible any more. Booo.